We hope you enjoy your visit and find what you're looking for. To contact Ann, please use the contact page. ANN IS EMBARKING ON HER FIRST NATIONWIDE TOUR OF THE UK! Ann is embarking on her first ever national theatre tour with her one-woman show, Strictly Ann: An Evening With Ann Widdecombe. ANN'S GREAT NEW DETECTIVE NOVEL IS OUT NOW! The Dancing Detective is a traditional detective novel set in contemporary Britain. When a murder is committed backstage on a popular TV dance competition, no judge or contestant is above suspicion. As events escalate and it seems that the murderer may strike again, the crime-solving efforts of the police are supplemented with those of a mysterious dancing detective in a desperate race to discover whodunit. Moving between past and present and unearthing long held secrets along the way, this is a case teeming with possible motives and in which nothing is as it first seems. Buy it at Amazon.co.uk in Paperback and Kindle formats. If you're interested in donating to Safe Haven For Donkeys in The Holy Land there are a number of ways you can help, please see the official web site. Just back from short holiday in Switzerland. 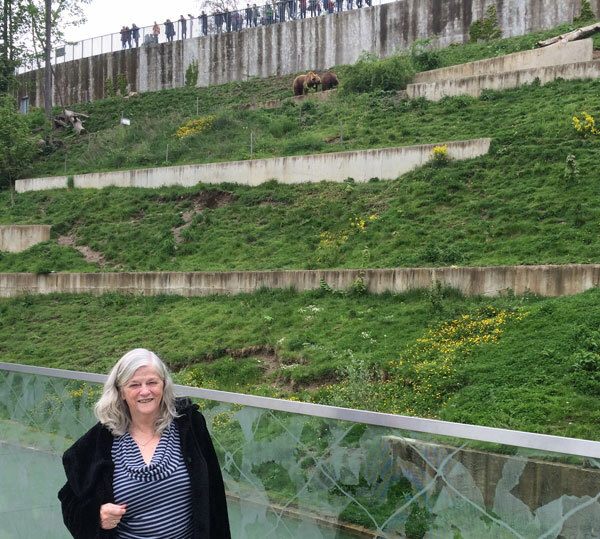 Enjoyed seeing the bears of Bern in their lavish new surroundings. Ann is Vice President of The Leprosy Mission and in December went to Ethiopia where nearly 4000 new cases of leprosy were diagnosed in 2012 and which is one of the top 10 countries suffering from leprosy. These men are crippled and blinded by leprosy and take it in turns to be carried to a begging point each day. If you would like to send a donation to The Leprosy Mission England and Wales the address is Goldhay Way, Orton Goldhay, Peterborough, PE2 5GZ. For more information about The Leprosy Mission you can visit facebook.com/pages/The-Leprosy-Mission-England-Wales or follow them on Twitter @leprosytalk. Ann has just returned from Morocco where she was supporting SPANA (Society for the Protection of Animals Abroad) in its efforts to secure better treatment for working donkeys and mules and campaigning against the use of monkeys and snakes in tourist attractions. Seemingly harmless activities harm animals, to get this message Ann posed for the ITV team that was travelling with her, snakes draped around her neck. Posing with snakes for pictures like this is a popular and seemingly harmless activity for a holidaymaker but the reality for the snake is gruesome. The snakes feed only every few months and are captured when freshly full. Their teeth are then extracted to make them safe for tourists and then when some months later they are hungry again but unable to eat, they are killed. Likewise the monkeys. Such fun to hold and cuddle. Such a great pic for the album with one sitting on either shoulder. Sadly it is not much fun for the monkeys, the mothers of which are shot to enable the young to be captured and when they are in turn bigger, heavier and less reliable they too are killed. SPANA's web site can be found here. Ann's autobiography is now in the shops and on kindle. Humorous and informative it covers her life from her childhood in Singapore through politics to Strictly Come Dancing. 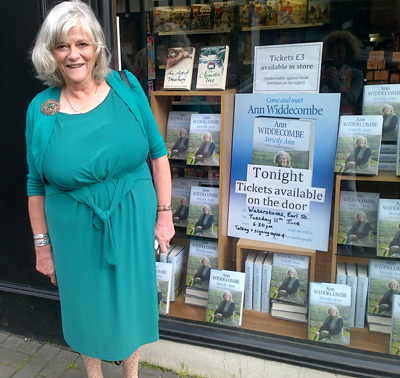 Here's Ann at one of her recent book shop appearances at Waterstones, Maidstone. Oops! Arrived at Gatwick and had no English coins for the trolley. A kind family gave me a pound, but resolutely refused to take my fiver in exchange. The fiver has now gone in a charity box and I promised the family that I would put this photo on my website by way of thanks! Strictly has had huge spin-off for Ann. Earlier this year Ann did the Live Tour and now Ann can truthfully claim to have played Wembley. She danced with Craig Revel Horwood throughout and he invited her to go in to pantomime with him in December. Tickets may be obtained from the Orchard Theatre, Dartford, Kent. "I spent 10 weeks doing a pantomime in the middle of a dance show so I might as well spend three weeks doing a dance in the middle of a pantomime"
Ann supports a BUPA initiative to encourage dancing for the elderly. Ann and Anton supporting the BUPA initiative. Ann drawing attention to the plight of the deaf. Earlier she had joined a party from RNID at Buckingham Palace to present the Duke of Edinburgh with ear muffs to wear while out shooting. "Get your ears checked" says Ann "with the same regularity you would have your eyes tested". Ann continues to enjoy life on Dartmoor and this is the view from her front window. My big event of the year! In July, I was awarded an Honorary from Birmingham Unversity, where I read Latin from 1966-1969. I was fascinated by the changes to the campus and in the style of student living.